A few weeks ago, I blogged about my first Cath Kidston. Well technically, the wallet was not my first Cath Kidston. My first purchase was made last May and was shipped through my Auntie A's US address. I took advantage of ASOS's Memorial Day sale and free shipping. Auntie A arrived last July but decided to include the bag in her luggage that traveled via sea cargo. And as you know, shipping via sea comes cheaper, setting aside the longer waiting period. We were expecting the end of July for its arrival. Unfortunately, that very lousy city ordinance that causes congestion in the Port Area of Manila contributed to the longer waiting period. Auntie A's shipment was delayed for almost a month. Despite the hassles of waiting, we are just thankful that all her items finally arrived. Last Thursday my Nanay texted me that my bags were already at home. After having a long day at work, I suddenly gained the energy to rush home for the most awaited bag. As soon as I reached home, I forgot my hungry stomach and aching legs. Haha This was the perfect way to end the day. Unfortunately, my excitement somehow faded away. It was replaced with a little disappointment. When I first lay my eyes on this bag, I fell in love with the darker navy blue shade. 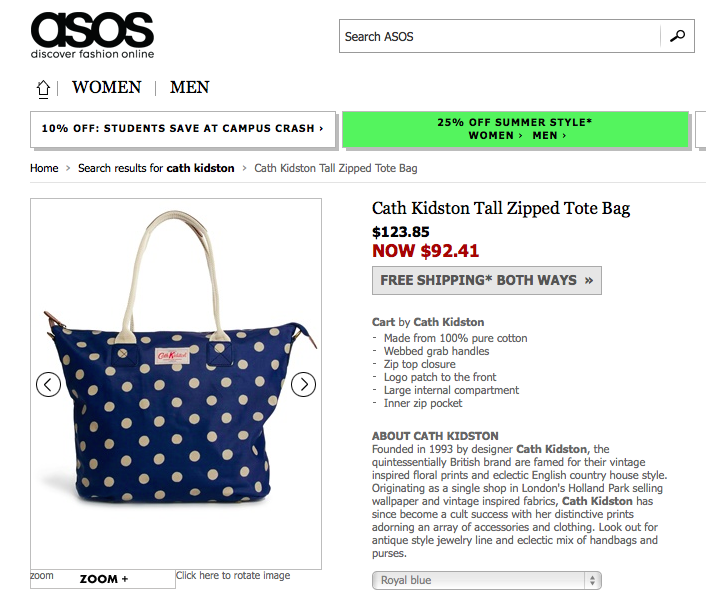 The pictures from both ASOS and Cath Kidston's site showed a shiny and dark navy blue bag. I love almost all shades of blue but I was quite disappointed that the bag emerged a bit pale and lighter in person. Even the classic sheen on all Cath Kidston products is not highly evident. The bag has been purchased and I don't think that returning or reselling is an option. So last Friday I decided to use the bag. I maybe disappointed with the color but the bag's functionality and quality didn't fail me. The seamless stitches in the handles make the bag very sturdy. I have no photos but the bag can accommodate a lot of my things. A netbook, foldable umbrella, makeup kit, daily dose of paperback, lock and lock fruit box and a pair of flat shoes all fitted inside the bag. I was about to say perfect stitching ;) but I guess not all Cath Kidston bags have it. Can you see the little metal buckle on the side? This tote can turn to a messenger bag. The bag comes with a detachable canvas strap. Yes to versatility! I believe all Cath Kidston bags come in YKK zipper. I'm not really sure about the purpose :) but I guess this helps the bag stand up and prevents the fabric from becoming worn out. Yes, loud and clear! I love your bag, Diane! It's something I would want to have in the future too (near future pala, #lastquartersale) because it's different from the usual sheen finish of Cath Kidston bags. Dear Diane im writing you with regards to your old blog on fake lacoste bag. I think i bought one myself this sept. 28 in a bazaar for 2,500 they say the orig. Price was 4,200 i was confident that its authentic bec. Its a well organized bazaar who would have thought. I know its fake bec. 1 the pvc texture is different from my old one. The stitches are not refined the color on the metal of the zipper is tarnishing . Pls. Email me so i can send you some pictures and maybe warn the others as well. My other email add. airness_232323@yahoo.com. Thank you. Hi! Please be the first one to send me an email. Please note that I don't authenticate Lacoste bags. What I shared on the previous post is my experience and how I was confined that I got a fake bag. If you are likewise convinced that you have a fake item, why not ask for a refund or email the reseller.